The Dolly Parton 9 to 5 Musical has been on an extensive UK tour for the last few months with cast changes due after it leaves the Churchill Theatre in Bromley on 2nd February. Ben Richards who is playing the boss Franklyn J Hart is leaving then for three months to go to Los Angeles for their "Pilot Season" which is typically the period between January and April when studios film samples of new shows. A pilot is one episode ordered by the network as a test which they will will cast, produce and test with audiences and studio executives to decide whether to pick it up as a regular series. Ben was due to do this over a year ago, but his plans had to be postponed when he was diagnosed with cancer, from which he now thankfully has the all clear. His part will be played until his return in May by Mark Moraghan who appeared in the West End playing Bob the Mechanic in Priscilla Queen of the Desert. Other musical credits include Mr Fair Lady, Our Day Out, You'll Never Walk Alone, Come Fly With Me as well as TV appearances in Brookside, Holby City, Casualty, The Bill and Doctors. 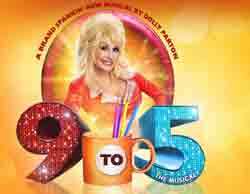 More 9 to 5 cast changes to be announced shortly.